My First Kickstarter Campaign – UberStax! I’ve always wanted to try something on the very popular crowdfunding website known as Kickstarter. It’s an amazing way of presenting a fresh idea to a community who are looking to support innovation. This is my first Kickstarter project, and something I’m very excited about! 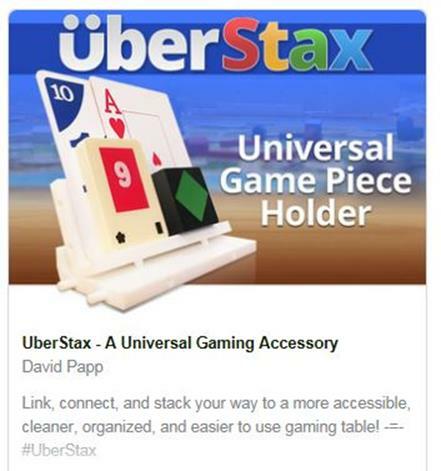 It’s called überStax, an accessory for anyone playing table top games. Young, old, families, and gamers. After designing numerous prototypes over the course of a year, I created a simple universal piece that snaps together with other pieces, becoming a purposeful ‘rack’ used to place cards, tiles, miniatures, or other game pieces during any gameplay. For people who love playing board or card games, überStax is a new twist on an old idea. For years, table-top card and token games have posed challenges for some players. Dexterity disabilities due to injury or illness can prevent some people from enjoying a simple game of cards, or dominoes. Children may struggle with the manual dexterity required to manipulate a hard of cards, and we’ve all experienced a Scrabble rack with too many tiles. I’ve heard from experienced card players, board game players, parents, RPG gamers, and combined that feedback with my own tabletop play experience. The result is an innovative way to save table space during those games that grow to cover a table. A flexible means to manage cards for those players with limited or diminished hand control; and an option for those who would like to have their hands free during a game for snacks and drinks. How well do they do against a non-solid surface? Like a sofa or a bed for example. It’s a great idea anyway, backed it. This is a product that i have been waiting for for a very long time. I game weekly and play a ton of games that could benefit from Uberstax. I am super excited to be on board while this product comes to life. Go Uberstax! We are very much looking forward to getting these. We have 3 little ones under 7 who love playing games as much as we do. These will allow them to see all of their cards/pieces without dropping them all over the table/floor. I’m sure we will end up using them for adults as well, especially our parents or when it’s just simply easier to use them instead of taking up a lot of space on the table or when a lot of bevvys are in the mix. I really like this Kickstarter… Playing games with my family will be much more enjoyable with these. My 10 year old has difficulty holding all the bits/cards, so this will definitely help! I think this is a neat idea. I hope more colors get unlocked. This should help my family stay neater and more organized when we play games.